I had so much fun putting together my recent contribution in Weve! It was one of the most colossal, creative and confronting pieces I’ve ever worked on. I felt a huge sense of responsibility to put something meaningful together and a huge sense of accomplishment at the end. However, I had stepped completely outside of my comfort zone and I was nervous. Had I nailed the brief? Did it make sense? Had I communicated my message, or just ended up being too obscure? I hope it says something to you and that it’s worth hearing. Then check out the other amazing contributions to the latest edition of Weve on Heroes Mingle. 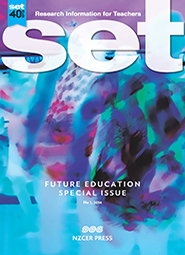 NZCER’s 40th anniversary special edition of SET is now available on line and will be hitting school staff rooms from next week. We can no longer predict knowledge needed for the future, which has significant implications for contemporary literacy programmes. In this article we argue that reconceptualising current literacy approaches will support teachers to develop future-focused literacy teaching. We suggest that a critical multiliteracies lens can provide rationale for a future-focused literacy programme (the “why”), and that the four resources model (Luke & Freebody, 1999) can provide a way to enact such a programme (the “how”). Drawing on our research using this approach with teachers, we provide a mapping template and reflective questions as a springboard to initiate reflective discussion. I’m also very excited to have a ‘think-piece’ published! Now is an exciting time to be involved in educating our next generation. The way we think about education and our approach to teaching is continually evolving, and our libraries are also undertaking a parallel evolution. They are no longer dusty, silent spaces where the main function is to store and catalogue books. Today’s libraries are becoming vibrant spaces for information seeking, sharing, creating, and communicating new learning. They encompass the best traditions of our old-world libraries while embracing multiple pathways to supporting, connecting and collaborating in our new educational environments. Twenty-first century librarians like me are still there with the right book for the right reader at the right time, but we are also enthusiastic mavens, passionate knowledge-seekers, and committed communicators in this burgeoning landscape. It has been an amazing experience to work through the process from submitting the abstract and having it accepted to finally seeing it in print. It was certainly a much harder and more robust process that I had anticipated, but I am so grateful for the experience and I now hope to write more about how librarians fit into the education landscape today and into the future. This is something I feel very passionate about and believe my knowledge in this area is growing as my role at Southland Boys’ High School continues to develop and I get more opportunities to work with staff and students in a range of ways. Who Else is Going To Do It??! I have had my head down, slaving away on many different work fronts in recent weeks/months. Today I made time for a little bit of Professional Learning and I’m SO glad I did! I was reading a posting on website Resource Link about attribution of images with Creative Commons License through Flickr and decided to explore their site for other gems. Boy, did I find a nugget of gold! This short 11 minute talk is completely inspiring and almost brought me to tears. If you have been wondering “why on earth do I bother?” ….. watch this. If you have been wondering “do I make a difference?” ….. watch this. If you have been thinking “what can I do to make a difference?” ….. watch this. If you are sick of fending questions along the lines of “why do we need libraries?” ….. watch this. If you have been wondering how to inspire your staff ….. watch this. Do you want to remember what it is you love about the possibilities of being in our profession? ….. watch this. I challenge you to remain unmoved, unchallenged or uninspired! Now, if you have read to the end of this posting and haven’t yet watched this clip ….. Watch it Now! Within the past few days the brand new free e-book from Kristin Fontichiaro and Buffy Hamilton has been released. School Libraries: What’s now, what’s next, what’s next to come is made up of a series of essays by a wide range of librarians from several countries expressing their varied views of school libraries as they are now and how the could be in the future. And what do I say? HEAR, HEAR!! I love this message. It speaks so strongly of my own vision I wish I’d written it myself! Some would say, rightly, that I have an awful lot to say for myself and in this instance I didn’t confine myself to just one essay. I got so fired up writing the first one on collaboration I couldn’t help myself and went on to write another one on networking and flock-mates. If you want to read them, you’ll find them here: in chapter 9 and 10 respectively. Pages 139 and 154. In this book you will read others views on the future and what concerns school librarians. These are the voices of the brave and the concerned. You must add your voice. If you read these essays and disagree, then disagree and suggest another view. If you read these and agree, then voice your support. If you read these and learn, use your learning and teach others. If, on the other hand you read these essays and voices and remain mute, you abdicate the future. Don’t. Respond with action – talk to someone about something you’re passionate about or do something to effect change – it doesn’t matter how small or insignificant you think it might be – just do it! And finally I just need to say – I love being a school librarian – that’s all.